The moment she learns her one-night stand with a tattooed man has made her pregnant, Karin is convinced she will give birth to a baby whose skin is a tapestry of color. When Anna is born normal in appearance, Karin still believes her child is predestined for some greater purpose. She begins a journey, intending to surrender her baby to people she believes will provide Anna a better life than she can. Yet, as she travels, she seeks a sign to tell her whether she should keep her child and discovers her life intertwines those of people she has never met, raising the question of whether anyone is ever really in control of their own destiny. Read The Tapestry Baby by Carole Waterhouse, our newest book from Zumaya Embraces. 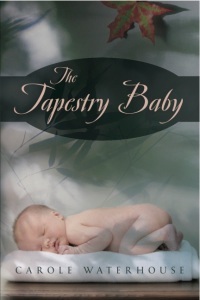 The Tapestry Baby will be available soon in trade paperback wherever fine books are sold. Now available in the Kindle and NOOK bookstores. When scientist Carl Racine’s genetically modified wolf Yukon discovers a body aboard a corporate helicopter, they both become a danger toTone about it. Unforced Error, a debut science fiction adventure in the classic mode by New Zealand author Mark Roberts.